With sadness, anger, and a sense of loss, we find ourselves forced out of our current location at 684 E Hastings in the DTES, the neighbourhood in which we have resided since 1973. The Heatley Block, where Spartacus is currently housed, is being renovated and ‘refashioned’ to host businesses of a different character, at significantly higher commercial rents – in our specific case, yet another cafe. 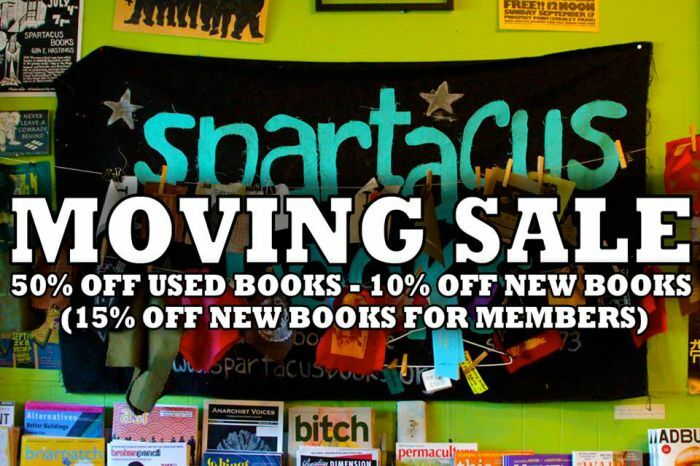 Spartacus Books, as an institution, has faced its share of adversity. Gutted by fire at our long-time Victory Square location in 2004, we rebuilt adjacent to the old location only to be moved along by rising rental costs. Today we find ourselves again moved along by the forceful advance of gentrification, pushing east from the Woodward’s redevelopment all the way down Hastings Street through East Vancouver. The adversity we have faced is but a small part of a larger scenario; for many, the broader processes at work here have implications at the level of subsistence and survival. Vancouver is built on colonial violence and dispossession: the displacement of First Nations communities has impacted generation upon generation, and the displacement of poor folks (including a disproportionate number of indigenous people and people of colour) by gentrification continues at a rapid pace. What little space of relative affordability remains in this city is being squeezed hard. On the one hand are arrayed powerful structural forces (the ongoing workings of colonialism and capitalism that are the basis of successive waves of displacement and the imposition of a way of life increasingly beholden to commodity markets and state systems of control); on the other hand there are those, in an endless variety of ways, who seek to challenge and resist gentrification and other forms of oppression and exploitation. The DTES has for decades appeared as an epicentre of struggle, and Spartacus Books, which has called the neighbourhood home for 40 years, has always sought to situate itself in solidarity with those who resist. 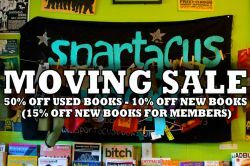 Spartacus Books has endeavored to be a space for all: not just radicals, activists or academics. By way of example, the “Peoples’ Phone” stands as an act of solidarity and not of charity, a very literal form of connection in a neighbourhood that, like so many others nowadays, is lacking public pay phones. We have endeavoured to be not only a space for radical politics, but a safe space useful and open to local communities; the neighbourhood has been essential to our identity, and we can only hope that our presence has been a welcome one. While circumstances have dictated our departure, the DTES is forever in our hearts, our collective memory, and our history. We will continue to support the fight against gentrification in the DTES and beyond, and against all forms of oppression and exploitation, from our new location in Cedar Cottage/Commercial Drive, East Vancouver. Spartacus itself is a project that has persisted through the decades on the basis of energy and time freely given by members of the collective (over 1000 volunteers over the years) and by our various community members intent on realizing forms of value other than those that can be calculated by the real estate speculators: the value that comes from putting our space, our time, and our collective energy to use in the name of sociability, cooperation, mutual aid, solidarity, learning, reflection, analysis, and confronting mutual challenges. We hope to foster these alternative forms of value by making Spartacus a hub for activism in our new location. The personal and institutional connections that Spartacus built in its former locale took time. We look forward to learning more about the Cedar Cottage / Drive / Grandview-Woodlands neighbourhood, which is itself experiencing a process of gentrification, and to forging connections with residents, workers, and others who make this area a part of their lives. Several collective members already call this neighbourhood home - and we encourage folks who want to be part of this project to get involved. Our new Cedar Cottage/Commercial Drive location is 3378 Findlay Street, a storefront that was once a neighbourhood grocery, at the intersection of Commercial and 18th, between Broadway and Nanaimo SkyTrain stations. That’s a short walk from Broadway/Commercial or Trout Lake, and on the number 20 bus route, adjacent to the Croatian Cultural Centre. At 3378 Findlay, we will make a new home for the foreseeable future. We will continue to stock a wide-ranging assortment of radical books and zines, a full range of periodicals, and all sorts of patches, t-shirts, posters, cards, etc. We also look forward to playing host to a diverse range of events: radical movie nights, readings, book clubs, organizing meetings, and musical performances (including the Squeezebox Circle), and more. Until May 23st : 684 E Hastings St.